Washington Capitals center Lars Eller, who left the second period of the team’s 4-3 win over the Calgary Flames on Friday night with a lower-body injury, skated prior to practice but left before the rest of the team took the ice and will be a game-time decision against forward Brad Marchand and the Boston Bruins on Sunday afternoon (12:30 PM on NBC). Defenseman Christian Djoos, who has been out since December 8 and underwent thigh surgery six days later, practiced and took contact. 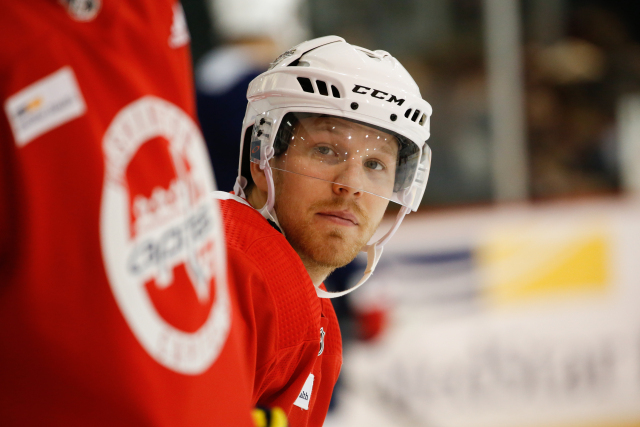 Capitals head coach Todd Reirden said that he could be sent down to the AHL’s Hershey Bears on a conditioning stint, but was non-committal towards that. Capitals coach Todd Reirden said Lars Eller (lower body) will be a game-time decision tomorrow vs. Boston. This entry was posted in News and tagged Christian Djoos, Harrison Brown, Injuries, Lars Eller, Washington Capitals. Bookmark the permalink. It’s high time, GMBM! “Package” #65 and #22 together, the Caps’ primary “disappointment” players, and make a “Hockey Trade.” Thirty-one games to go. It’s time to make a move NOW.